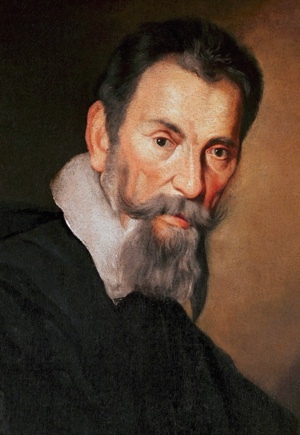 CD REVIEW — Claudio Monteverdi (1567–1643) is perhaps best known as one of the premier figures in the development of opera. His madrigals, too, are well known for their exploration of what Monteverdi called the seconda prattica — a new emphasis on textual expression through bending the traditional rules of dissonance treatment. As such, he played a crucial role in the transition from Renaissance to Baroque modes of composition. Aside from the large-scale Vespers of 1610, however, his sacred music does not often garner the same attention as his secular works; this is in part due to the monstrous 30-year gap between the Vespers and his next significant liturgical publication, the Selva morale e spirituale. The Selva, or “forest,” was a collection of works composed at the Basilica of San Marco in Venice, where Monteverdi worked from 1613 until his death. He dedicated the collection to Eleonora Gonzaga, widow of his former patron, Vincenzo, Duke of Mantua. In it, Monteverdi gathered all types of sacred music, including a complete Mass, spiritual madrigals, Marian hymns, psalm settings, and motets. He also wrote in all of the fashionable liturgical styles of his day, with the large vocal and instrumental resources of San Marco, and its particular acoustics, specifically in mind. He used the old-fashioned stile antico style in his Mass, while madrigals were accompanied in modern style; several hymns were written for the double choir accompanied by instruments that were so popular in Venice, and his motets for one voice and basso continuo clearly draw on his operatic expertise. It was such a huge publication that it required ten separate partbooks for all of the voices, instruments, and basso continuo. 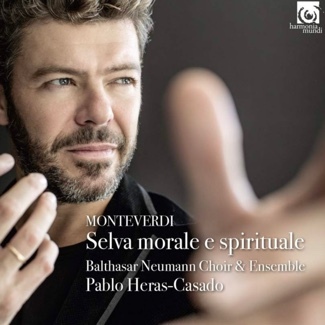 This new release from conductor Pablo Heras-Casado and the Balthasar Neumann Chor & Ensemble contains fifteen of Monteverdi’s works from the Selva morale e spirituale: several of the hymns, psalms, motets, and madrigals, alongside settings of portions of the Credo. It’s an exceptionally vibrant recording, one that walks a fine line between brilliance and flamboyance. The recording is at its finest in the works requiring smaller numbers. 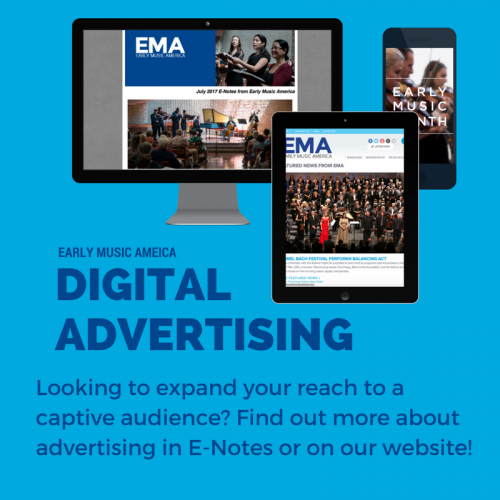 Each individual singer in the ensemble has a warm, rich, yet flexible voice that works well in soloistic or small group situations, but that when used en masse creates muddied text and overpowers all accompaniment but the cornetti. Listen, for example, to the duet section toward the end of the opening track, the second “Dixit Dominus”; the voices are crystal clear, as is the accompaniment (the violins, gamba, and plucked strings), but the group sections that bookend it become just a bit bogged down by the combined forces. The massive cadential embellishment that concludes the work also straddles that aforementioned line, as the cornetti are nimble to the point of flashiness. Much more successful, in my opinion, are the gorgeous “Iste confessor,” where the violins, cornetti, and harp truly shine against Jakob Pilgram’s tenor; the “Et resurrexit” and second “Salve regina,” each for two sopranos and accompaniment; or even the bouncy syncopations of the madrigal “O ciechi, ciechi.” Overall, a recording that rewards on repeated listening, and a worthwhile addition to a Monteverdi fan’s collection. Karen Cook specializes in the music, theory, and notation of the late medieval and early Renaissance periods. She is assistant professor of music at the University of Hartford in Connecticut.